Dental pulp testers are a valuable tool in illustrating pulp health. Dental pulp testers fall into two categories: sensibility tests or vitality tests. Sensibility tests include thermal and electric tests; these are based on sensory response. Vitality tests include tests like laser doppler flowmetry or pulse oximetry. Sensibility tests are commonplace in clinical situations and although the prospect of vitality tests look promising, false results can lead to misdiagnosis and incorrect or unnecessary treatment. 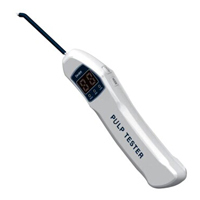 Dental pulp testers can also be combined with features like apex locators. Whether your dental practice chooses a sensibility tester or a vitality tester for a dental pulp tester, be sure the vendor chosen is reputable.